This past weekend was very busy race-wise. Well, not for me personally as I wasn't racing. But I did have about 10-15 friends who were in St. Louis, Knoxville and Chattanooga on Sunday racing varying triathlons, with most of them doing Ironman Chattanooga 70.3. While I missed being at these races in person, I had a lot of fun following everyone online and hearing about their experiences post-race. Two of my friends, Derrick and Karen, deserve special shout-outs because not only did they race over the weekend, but they both fell pretty hard. Did they quit? Nope. Both got up and finished their races and they both set personal records! How badass is that?! I'm sure you're thinking that they couldn't have been injured that badly, right? Turns out - Derrick has one of the worst sprained ankles I've ever seen (it's really gross) and Karen has a broken clavicle. Yet, they both finished and PRed. I gotta tell you - triathletes are a special breed. And speaking of special, I want to tell you about another friend, Victoria, who finished the REV3 Knoxville 70.3. I know Victoria through my cycling club - the Tennessee Women's Cycling Project. You know those people who are so nice and genuine that they make you feel like you need to be a better person? Victoria is one of those people. She is one of the happiest, most positive people I know. And man, does she LOVE to ride her bike. I think about her sometimes when I don't feel like riding. Her positive attitude reminds me that I'm pretty damn lucky and it's a privilege to be able to ride as much as I do. But what makes Victoria even more special is that she is also a Type-1 diabetic. I'll be honest, I don't know a lot about diabetes, but I do know that her pancreas doesn't produce insulin properly/ at all and she has to check her blood sugar regularly. Exercise doesn't exactly mesh well with being a Type-1 diabetic either, so doing something like a 70.3 is much harder on her than on non-diabetics. Doesn't stop her from doing them though. In fact, one of the main reasons she keeps signing up for long-distance endurance events is to keep proving that diabetes doesn't have to keep people from doing the things they love. Victoria finished Sunday's 70.3 as the last place finisher. She finished 23 seconds before the 8.5 hour deadline and she is thrilled about it. She wrote a recap about her race here, and I really encourage you to go read it. I defy you to read it and watch her cross the finish line without tears in your eyes. I don't know what inspires other people to get up an do crazy things like triathlons and the like, but my friends are a huge source of inspiration and I am so thankful that I get to follow their journeys. It doesn't matter if I see someone training for a 5k or an Ironman. I see people out there crushing it, and it makes me want to go crush it too. Thanks, friends! FYI - my next race is Ironman Raleigh 70.3 in two weeks. Between a calf tear and my grandmother's death, my training has been less-than-optimal. However - I've had three weeks of solid training (YAY for all green in Training Peaks! ), so I'm hoping I won't completely fall apart on the course. We'll see. Imagine this: You're at home just living your normal life when you receive a letter from a lawyer's office stating that you had inherited something. Interesting, sure. But then let's say that you were the sole beneficiary of the entire estate and you inherited property and stocks. MUCH more interesting, right? And then throw in that you had never met the person who left you everything. Well, that's the foundation for a good book, and that book is "The Perfume Collector" by Kathleen Tessaro. 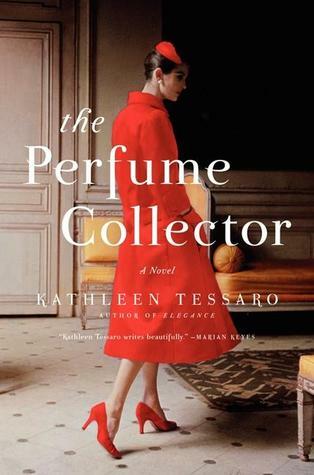 "The Perfume Collector" tells the story of two women - 1950's Grace Monroe and 1920's Eva d'Orsey. Newlywed Grace is having a hard time fitting in her role of a London socialite. Parties don't interest her, and she believes her husband is having an affair. Then she receives a letter from a Paris law office stating that she is the sole heir of an estate previously owned by Eva d'Orsey, a woman Grace had never met. She wasn't even familiar with her name! Not satisfied with just signing the legal papers, accepting her inheritance, and moving on with her life, Grace starts investigating who Madame d'Orsey is, and what their connection might be. Told in flashbacks, the book follows Eva starting as an orphan in New York City to her as an adult in Monte Carlo and war-time Paris, and tells how she became the muse to one of Paris's greatest perfumers. What Grace finds out about Eva could change Grace's life forever. This book interested me on many levels. First off - who wouldn't want to inherit a ton of money from someone they didn't know? Apparently, though I don't know the details, the premise of this book of an unknown bequeathal was based on a true story. Secondly, as you can probably tell from the title, there is a lot of information about perfume in the book. Back in the day, it was considered gauche to wear mass-produced perfume. Ladies were supposed to have their own signature scents. And you wouldn't wear the same scent day after day. No - you had different scents for different events because why would you want to smell the same day after day? (Sidebar: coming from the perspective of a cheap triathlete who smells like chlorine or a gym most of the time, and who gets most of her perfume from Birchbox samples, this part blew my mind.) Also - they make perfume out of some crazy stuff like hair! Who knew? I absolutely recommend this book. It was an easy read and while I'm generally not a fan of flashback storytelling, this one really had to be told in that format. Give it a shot and let me know what you think! And let me know what you're reading! I'm always looking for recommendations! The race report for the Dairy Dash is a little late - like a month. My 101-year old grandmother passed away a few days after this race and I've been too busy with life to write anything. 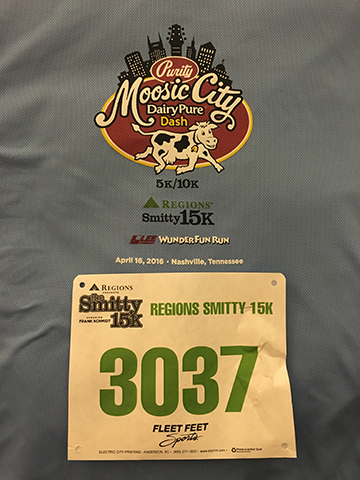 For those who don't know, the Dairy Dash is kind of a Nashville tradition. It's held every Spring in Metro Center. It's sponsored by Purity Dairies and one of the big draws is that they give away ice cream at the end. 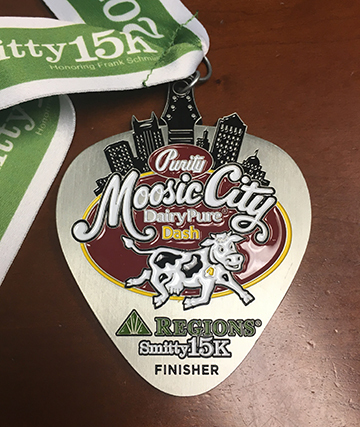 In years past, it's had a 5k and a 10k, and I usually run both (as a lot of people do). However this year, they added a 15k, so I signed up for that instead. This race has a lot of pros: It's conveniently located with a ton of parking. It's a flat, one-lap course. It's a very popular race and I got to see a lot of friends. It raises a lot of money for local charities. It's a great, great race and it was run very well. I just have one issue: THEY RAN OUT OF ICE CREAM FOR THE 15K!! Do you have any idea how upsetting it is to run almost 10 miles thinking there is ice cream at the finish and then have there not be any? It's VERY upsetting. I kind of understand how this happened - the Kid's Fun Run and the 5k started first, and therefore got first dibs on the ice cream. The 10k started with the 15k, however, I heard that they ran out even before the 10k was done. But let's be honest, while I understand HOW this happened, there really isn't any excuse FOR this to happen. The race director knows how many people sign up for the race - they should have that much ice cream! It's not hard! If they see the inventory moving too quickly, then hold some back for the later races! OK - that's the end of my rant. As I said, it's a great race and I'll run it again. I did get a fancy medal at the finish. That was nice. I mean, it's not ice cream, but it's still nice. On a another note, I had to skip the Flying Pig Half Marathon on May 1st. I was traveling back from Nebraska, which was where my grandmother lived. I stayed longer than originally planned to help my parents with my grandmother's estate. I've wanted to do Flying Pig for years, but family comes first. I'm hoping I'll be able to do it next year. My next race is Raleigh 70.3. This will be VERY interesting because I'm way behind on my training. I was too busy to train while in Nebraska, and I really didn't have the facilities either. This is probably the least prepared I've been for a race, and that includes last year's Chattanooga 70.3, which was a mess. I'm not really sure what to expect in Raleigh, but I'm working hard to hit all of my training in the three weeks I have left. It won't be enough to pull out a great result, but I hope it won't be terrible. We'll see!